There we were, in the garage again sanding, molding and tweaking our design with sweat rolling off our faces and backs. We spent countless hours together in that garage, not to mention a substantial amount of money testing various materials, perfecting even the most minute details. We weren't giving up until we found a design that was lightweight and comfortable, but durable enough that we would want to carry our own handguns in. So, why were we spending so much time and money in that garage together? Quite frankly, because we were tired of buying crap! Whether it was poor design, materials, or a combination of the two, we had yet to find a product that met our high-quality standards. Throughout the entire process, we knew that in order for our customers to be 100% satisfied with the quality and durability of our holsters, they had to be damn near indestructible! Another determining factor for the final design was versatility, because we wanted a product that customers would want to use whether they were participating in a competition, hunting, in the line of duty, or using for every day carry. After tweaking the design numerous times, evaluating the results, getting feedback from our friends and customers, and tweaking again…Tap Rack Holsters was born! Tap Rack Holsters is a leading provider of premium, American-made, custom gun holsters. Thanks to our loyal customers and clientele, we are now operating out of a full-scale manufacturing shop in Fresno, CA. Our products are the result of 40 plus years of experience in the Military, Law Enforcement, Competition, or every day carry, extreme attention to detail, and countless hours and dollars spent testing various materials and styles. We’re dedicated to building the best kydex products possible and ensuring our customers are 100% satisfied with our products. At Tap Rack Holsters, our principles are simple. We aim to provide premium quality products our customers can rely on. Just as we did years ago in that garage, we hand-craft each of our products with care and precision, according to your specifications. All our products are unique, and we go the extra mile to ensure the final result is a holster you can rely on. We assembled a team and advisory committee, consisting of members with firearm backgrounds such as: hunting, competition, law enforcement, and/or military. 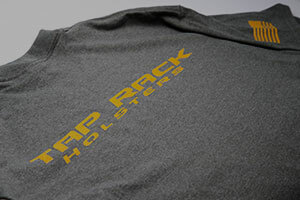 At Tap Rack Holsters, we stand behind our products 100%. The majority of our holsters are formed using .080 Kydex. Molding .080 Kydex may take longer to build and is much harder to work with than other materials, but the final product is a holster that is damn near indestructible as a result of the extra effort. Our holsters have the simplest warranty that we could come up with. If it breaks or wears out, we will replace it free of charge. We continuously test our products to ensure they will meet any demand. Whether you’re shooting a match or on a high risk mission you can be confident that your Tap Rack product will not fail. Visit our online store to see the variety of holster types we have to offer including: light bearing holsters, magazine pouches, concealment holsters, competition holsters, and duty holsters.